"A Night At Gandhi Ashram"
Kochi, Kerala: 39th Wellbeing Tibetan Medical Camp concluded on September 20, 2014 with lot of memories some etched in the history of Friends of Tibet. The four-day camp began with the Men-Tsee-Khang team arriving from Bangalore. The last two camps saw a heavy downpour and a pleasant weather. Just like the participants smile when they arrived at the camp, the sun shone bright, spreading ray of happiness and vigor. It was also an important day for the country. It was the birthday of Prime Minister of the country, and the nation was gearing up for a 'special guest', who was supposed to gift the nation with billions of US Dollars for development projects in the next five years. The same day saw intrusion of troops into our country, in thousands, from the special guest's nation. At Sabarmati Ashram, Gujarat, amidst hordes of security rings, a silent protest was in the making; Perhaps the first non-violent protest since the Mahatma left the holy soils of Sabarmati in 1930. Tenzin Tsundue, Tibetan poet-activist, was waiting inside the Sabarmati Ashram. 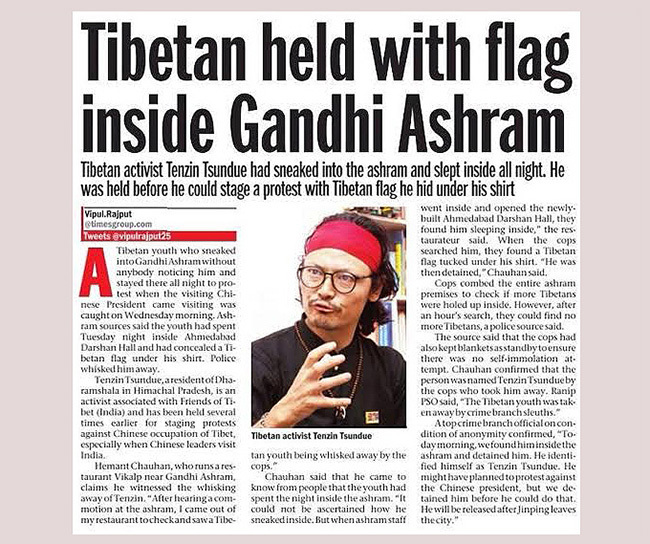 "A Tibetan youth who sneaked into Gandhi Ashram without anybody noticing him and stayed there all night to protest when the visiting Chinese President came visiting was caught on Wednesday morning." Tenzin Tsundue, who's also a Friends of Tibet Campaigner is well known for his peaceful protests during the visits of Chinese dignitaries. The 2002 protest from the 14th floor of Oberoi Towers, Mumbai and 2006 protest from 200-feet high rise of Indian Institute of Science (IISC), Bangalore brought inspiration and hope to people thirsty of freedom from a monster nation. His entry into the holy grounds is still a mystery for the police force. 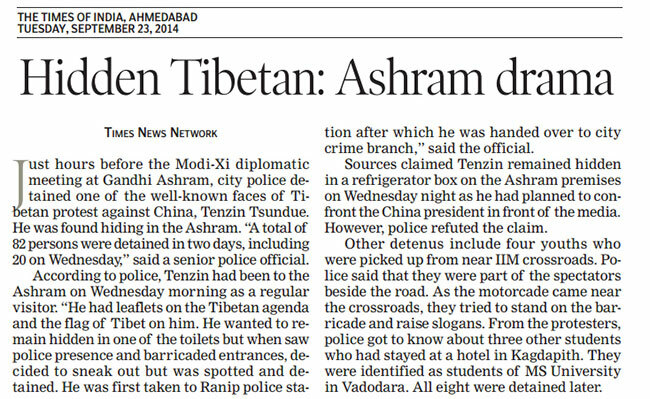 "City police chief Shivanand Jha has sought answers to how did Tibetan protestor Tenzin Tsundue sneak into the heavily guarded Gandhi Ashram before Chinese President Xi Jinping's Ahmedabad visit... City police had even got about 4,000 pamphlets bearing Tenzin's photo printed and circulated these among personnel deployed"
The Tibettan freedom fighter was however caught in the morning with pamphlets and the outlawed Tibet National Flag. He was taken to the Ranip police station and further to Crime branch for an exhaustive round of questioning. In the mean time world over media reports and radio telecast sang the historic entry and the Voice of Tibet was heard world over. Initially the Information & Broadcasting ministry had issued message not to release his name in the media telecast and the television media was prevented from covering any news report from Ground Zero Protests at Sabarmati, but only release clippings of protests in Delhi and elsewhere. "What could the cops do? What could the cops do; while the Chinaman was there, they had to show some teeth and I some wit, but once the dictator left we all laughed at our foolery over many rounds of masala chai, the police station roared with laughter. However, the Chinese did that nasty thing, attempting another incursion on Indian border for a full mile, while their President went around India with a half-smile. Now that the Chinese are out, Indo-Tibetan friendship is up and about," wrote Tenzin Tsundue while in police custody.